More often than not, the discussions were prefabricated by the speaker as if we were in a theatre rehearsing a play with a crew of talented speech makers ... If any of the new members … insisted on going against the flow, he would be brought back to the "correct" path either through incentives if available or through terrorization and punishments if necessary. 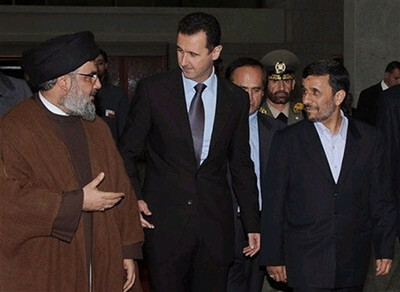 Hezbollah leader Hasan Nasrallah (left) speaks with Syrian president Bashar Assad (center) and Iranian president Mahmoud Ahmadinejad on their arrival for a dinner in Damascus, February 25, 2010. The dinner came only one week after U.S. Undersecretary of State William Burns visited Damascus and was a clear indication of how little Bashar valued U.S. efforts to try to pry Syria away from its ally Iran. Thus in 2008, Transparency International, the most respected index of perceived corruption, ranked Syria as second worst in the Middle East and North Africa, after Iraq, with marginal improvement in 2009. According to the World Bank, Syria ranks among the world's lowest in the ease of doing business—143rd out of 183 countries surveyed, a drop from a previous 138th place. The Syrian government persists in making superficial gestures of improvement, but most state initiatives are Potemkin reform at best, merely facades. While it is certainly possible to reform the Syrian economy, Damascus has little incentive to do so, monopolizing as it does the profits of widespread corruption. Absent pressure from external sources such as the U.S. government or the European Union, corruption—and security risks to the region and the West which derive from it—will worsen. The Syrian regime's primary goal is to stay in power and as long as this is so, its interest will never shift to economic growth and development. Syria's culture of corruption inherently blocks meaningful long-term domestic reform, and the regime instead will continue to focus on sponsoring terrorism and blaming Israel and the West for its woes. High hopes for a Damascus spring have ended in an ongoing winter. Under the leadership of Hafiz al-Assad (1971-2000), Syria closed itself to the world. Even before the 1970 coup that brought him to power, the Baath party he would soon head had enacted an emergency law on March 8, 1963, that suspended basic constitutional rights such as freedom of speech and assembly. Article 8 of Syria's 1973 Constitution, developed by the Assad regime, assigned all government posts to Baath Party members. The Syrian government soon put heavy and impractical regulations in place; any significant commerce required bribery of key officials. Although Syria struck oil in 1968, and high prices during the 1973-74 oil crisis boosted the country's economy significantly, by 1995, Syria's oil output began to dwindle due to technological problems and depletion of oil reserves. By 2007, Syria had become a net oil importer. To get an appreciation of the current state of the Syrian economy, it is instructive to look first at Syria's gross domestic income (GDI) per capita. According to the most recent International Monetary Fund (IMF) figures, that number was $2,579 in 2009. By comparison, Lebanon's GDI was $8,707 and Turkey's, $8,723. Israel's was $26,797 while two other authoritarian states, Libya and Iran, had a GDI of $9,529 and $4,460 respectively. Inflation, while fluctuating, has increased in relative terms almost every year since 2000, Bashar's first year in power. It reached double digits in both 2006 and 2008, and by 2007, Syrian newspapers were openly discussing the price of eggs almost as much as key economic issues. The unemployment rate has also increased dramatically. While the government acknowledged a rate of around 8 percent in 2007, the International Labor Organization estimated the reality was more than double that. The IMF assessed Syrian unemployment at the end of December 2009 at close to 11 percent. In June 2005, the United Nations Development Program found that 30 percent of Syrians (more than five million) lived in poverty, with 11 percent (almost two million) in extreme poverty. In January 2008, the official Syrian daily Al-Thawra reported that the "average share of food per capita in the Arab world indicate[s] a decline in the per capita share of the Syrian individual, ranked second in 2003 among the 19 Arab nations to sixth place in 2005." As recently as March 2010, Al-Thawra stated that the "real income of the majority of the population has declined." The Syrian infrastructure is also severely outdated. In the summer of 2007, widespread blackouts hit Syria. Former Minister of Industry Issam Zaim complained, "We're seeing none of our officials being held accountable for their mistakes." While the regime tried to blame sanctions for the power failures, Zaim contended that real responsibility lay with those who for years procrastinated in upgrading the national power grid, which operates on decades-old technology. Nevertheless, the blackouts continue. According to the U.S. State Department, Syria's trade numbers remain "notoriously inaccurate and out-of date," raising questions about the veracity of the Syrian government's claims that its non-oil export sector has been expanding. While it may hope to bolster the economy through trade, its recent agreements are little more than mirages. Syria now has "all kinds of memoranda of understanding with Iran, but … most of them are worthless," said former World Bank official Nimrod Raphaeli. Iran and Syria reportedly reached an agreement in May 2010 to create a joint bank to improve weak economic relations between the two countries. However, Arabnews.com reported one analyst view that the announcement is most likely "just a propaganda trick and nothing will really change." Only Qatar and the United Arab Emirates invest significant money in Syria, mostly in the real estate and tourism sectors, but the amounts are not substantial enough to spur growth. The tobacco industry may have potential for development, but the Assad family's large and controlling interest prevents the entry of other investors into the sector. Indeed, Volcker Perthes, director of the German Institute for International and Security Affairs and an expert on the Syrian economy, said that while corruption might be "more diversified in Iraq … in Syria it is more strongly linked to the 'royal family'… Nothing moves … politically, and of course, the best people are leaving the country." He notes by comparison that neighboring "Jordan has done much better … even though they have less resources." The country's population has doubled since the mid-1980s with population growth estimates of 3.3 percent for 2008. By comparison, the World Bank's latest available statistics put the entire Middle East-North Africa regional population growth at 1.7 from 2008 to 2009 and project it to go down to 1.6 in the next two years. In fact, Syria was among the top twenty fastest growing populations in the world in the 1980s with average population growth of 3.4 percent between 1981 and 1990. Adding to the strain on the stagnant economy are Iraqi refugees, whose numbers are estimated at 300,000, 750,000, or more than a million by various sources. The Syrian government may acknowledge difficulties but seldom takes direct responsibility for the state of the economy. In a 2006 speech to Baath party loyalists, Prime Minister Muhammad Naji al-Utri blamed factors such as population pressure, a low level of foreign investment, and low technical standards for Syria's poor economic performance without drawing any connection to how the Syrian policies themselves led to some if not all of these problems. By the beginning of the 1980s, the desire for financial benefit and political advantage had supplanted ideology as the main reason for Syrians to join the ruling Baath Party. Three families emerged as the new Syrian business elite—the Assads, the Shalishes, and the Makhlufs with perhaps ten other families forming a second tier. Upon his death on June 10, 2000, Hafiz al-Assad left Syria's economy in debt, underdeveloped, and in a shambles. Many Syrians and Western diplomats greeted his son Bashar's accession with optimism. And, indeed, there was reason for hope: Analysts noted that Bashar was Western-educated and might be more reform-minded and less inclined to continue his father's rejectionist path. Initially, it indeed looked as if the younger Assad might tackle corruption; as heir apparent, he had spearheaded an anticorruption drive. But whatever reduction in corruption occurred at lower levels of government, it was more than offset by increases at higher levels. For example, in 2001, when Bashar's maternal cousin, Rami Makhluf, won a monopoly over telecommunications, prominent businessman and parliamentarian Riad Seif insisted on investigating the licensing and published a report documenting the corruption involved in the deal, despite the government's warning him off. Seif's bold declaration resulted in his arrest and imprisonment. Upon his release in 2006, he reiterated his claim and described how two telephone companies, Syriatel and Ariba, had colluded with the government to create a monopoly, enabling them to charge exorbitant prices—higher than in the United States—and make enormous profit while paying little tax. All the while, the government continued to refuse to enforce regulations while Syriatel and Ariba unilaterally voided consumers' contracts by refusing to supply agreed-upon minutes or provide promised discounts. These two companies won a contractual concession to provide service for a maximum 1.7 million persons, but they have already doubled this number and may even double that, which went against the terms of their contract and further secured their status as twin monopolies. By 2005, corruption had reverted to the levels of pre-Bashar days, albeit with a smaller circle of participants as Bashar had purged many of the old guard. The Assad family and assorted cronies appeared to have siphoned off as much as 85 percent of Syrian oil revenues that year, according to Syrian officials' private estimates. But the identities of the members of this business elite remain shadowy. It took the Syrian news magazine Al-Iqtisadi more than a year to compile a list of Syria's top businessmen because of the paucity of publicly-available information. Even then, some figures were simply too sensitive to include: It is telling that Rami Makhluf, one of the biggest players in the system, was absent from the list. the overall entrepreneurial environment is hampered by significant institutional challenges. The regulatory and legal frameworks are deficient, and persistent state influence in most areas of the economy suppresses market competition. The judicial system is inefficient and remains vulnerable to political influence and widespread corruption. Average tariffs are high, keeping trade freedom far below the world average. Even within Bashar's police state, this sorry situation is widely known. In 2008, Syria Today, the country's only independent English magazine, reported that "the overwhelming majority of Syrians believe their country's institutions are inherently corrupt." You have laws [in Syria], but you don't have rule of law … You don't have a fair, transparent judiciary system, so if you are a foreign investor, and you happen to draw the greed … of a figure closely linked to the system, you may end up with much of your investment lost. In 2002, the regime established an Expatriate Ministry in order to cultivate direct investment from abroad. But while the ministry initially attracted investment from the Syrian diaspora, financial backers' patience did not last long when they saw how unwilling the regime was to tackle corruption. A case involving SyriaTel illustrates regime tactics. In 2000, SyriaTel received a governmental license for mobile phone services. Rami Makhluf owned 75 percent of the company while Orascom, an Egyptian company, owned the remaining 25 percent. Two years later, Makhluf complained in a Damascus court that Orascom had cheated him. The Egyptian CEO and marketing director claimed they were then threatened by Syrian intelligence (Mukhabarat) and by April 2002, the CEO was given three days to leave town. As Perthes observed, "If an Egyptian company with good knowledge of the intricacies of doing business in the Middle East was not able to prevail in the Syrian market, international investors are unlikely to be optimistic about their prospects." As a result, many investors pulled out although those who were able to link themselves to high officials in the regime benefited greatly and stayed. The majority of Syrians who have no ability to leave the country are all too vulnerable to these kinds of manipulations. Once a business becomes profitable, the Assad government either demands a share of the profit or simply does not allow it to operate. Syrian officials who dare to go against the regime find themselves in jail or worse. Issam Zaim, for example, was forced to give up his post as minister of industry in 2003 because he made a decision in favor of a German company based on the actual text of Syrian law. His personal assets were frozen, and he temporarily left Syria in fear of his life. It should come as no surprise then that domestic investment is paltry. In 2005, the Baath Party Congress called for the creation of a "social market" economy without defining what this meant. Subsequent initiatives were haphazard, and it is now evident that the tenth Five Year Plan has failed to reach its objectives. Today, the Syrian economy is less than a third of Egypt's; the IMF reported Syria's gross domestic product (GDP) in 2009 to be $53 billion, in contrast to Egypt's $188 billion. Even in war-recovering Iraq, GDP was $66 billion. The World Bank ranks Syria as a lower middle-income economy. The Washington Post recently credited Bashar with reforming the Syrian economy by lifting Soviet-style economic restrictions while noting the need to tackle widespread corruption. Although Syria looks different today than it did under Bashar's father, movement is not always synonymous with change. Bashar's reforms ultimately are aimed at keeping the regime alive given new regional and international realities, which necessitate a different style than his father's. Corruption in Syria prevents it from being as open to the world as it would like to appear. Absent any serious reform in the Syrian banking sector, it will be impossible for Damascus to mobilize foreign savings and attract foreign capital. Thirteen private banks opened in Syria as of January 2010 but the six state-owned banks—the Commercial Bank of Syria, the Agricultural Bank, and the smaller Real Estate Bank, Popular Credit Bank, Savings Bank, and Industrial Bank—dominate, making it harder for the private banks to grow. There has been little restructuring of public banks in order to improve their regulatory and supervisory framework. The first private bank only opened in Syria in 2004, and while branches have opened around the country and private banks have increased their market share, the Central Bank of Syria, under the control of the Ministry of Finance, continues to regulate these banks, so they cannot make such decisions as setting their own budget or developing a business strategy, a situation reminiscent of eastern Europe during the Soviet era. Credit remains centrally allocated and subject to manipulation. A private consultant, who compiled a confidential study on the Syrian banking sector in 2006, found that bankers expected 15 percent kickbacks on loans, in exchange for which they overvalued collateral. A bank reform expert explained that only two banks, the Commercial Bank of Syria and the Real Estate bank, "are allowed to get involved in foreign correspondence," further choking off robust growth. Monetary policy also remains problematic. While the IMF commended Syria in 2008 for "making significant progress in strengthening the role of the Central Bank of Syria (CBS) in formulating and implementing monetary policy," Damascus has not made public information indicating its adherence to the IMF's Code of Good Practices on Transparency in Monetary Policies. Indeed, in August 2008, the IMF expressed "serious doubts about the operational independence" of Syria's Central Bank in setting monetary policy and recommended that Syria establish a new central bank law to strengthen the Central Bank, the country's monetary policy framework, and banking supervision. Further, the market for Syrian treasury bills, which were introduced in late 2008, remains relatively thin because the government restricts their use to project financing, resulting in their being used sporadically rather than on a regular basis. While the IMF observed overall progress in transition to a market economy, in March 2010, it noted that "the remaining structural reform agenda is substantial." Nine out of twelve standards are at an "insufficient information" level, indicating a serious lack of transparency. In two other areas—data dissemination and payment systems—Syria is non-compliant. Although a written bankruptcy law exists, it is not applied fairly. The Syrian government is further unwilling to take serious steps necessary to make those banks it controls more efficient. Knowledgeable insiders report that each of the six publicly-owned banks employs around 12,000 Syrians. One analyst working in the banking sector, who spoke on condition of anonymity, estimated that any reform would require the firing of between 50-70 percent of these employees. The lack of any social security net further hampers government options since the regime would be forced to deal with a significantly larger unemployed population without financial or health benefits in a situation where unemployment is already high. Nor is it likely that bottom-up reform will occur. A repressive mentality predominates in which employees are unable, unwilling, or afraid to make decisions, fearing the wrong decision could earn them a jail sentence or worse. Supervisors hesitate to offer training to subordinates, fearing that they will be eclipsed by their own employees. Even when employees do receive professional training, they find little opportunity to use their new skills. The managers, ironically, also have little power. "Unless you're linked to the regime, you have no power," explained one member of a banking reform project who spoke on condition of anonymity. Can Washington Tackle Syrian Corruption? used intimidation and his close ties to the Assad regime to obtain improper business advantages at the expense of ordinary Syrians … The Assad regime's cronyism and corruption have a corrosive effect, disadvantaging innocent Syrian businessmen and entrenching a regime that pursues oppressive and destabilizing policies, including beyond Syria's borders, in Iraq, Lebanon, and the Palestinian territories. How effective such actions are in forcing change in Damascus is a matter of debate. SDNs are subject to the freezing of their assets, and American "individuals or entities" are prohibited from doing business with them. However, like most SDNs, Rami Makhluf does not have assets in the United States. Still, it is often not in the best interest of other countries to do business with any SDN. According to the Treasury Department, the designation made it hard for Makhluf to do business, and a deal he had struck with Turkcell, Turkey's leading mobile telephone operator, fell through. However, The Washington Post reports that the effect of the Makhluf designation was largely political and psychological although still significant. The Syrian business community, which largely resented Makhluf for his bullying business tactics, was particularly happy to see this restraint on government-sanctioned corruption. The Syrian regime's corrupt practice is aimed at only one thing—maintaining power. While Syrian diplomats trumpet a series of reforms, Bashar al-Assad's regime is simply trying to stay alive, adapting to regional and international realities while impoverishing the country and eliminating anyone who wants to see change. The economy, despite many reports about improvement, is headed downward. The culture of corruption and an old, Soviet-style mentality in both the political and economic spheres prevent meaningful reforms in banking, telecommunications, and non-oil exports, all of which would help integrate Syria into the global economy as a respectable partner and improve living standards for its citizens. The Obama administration's shift in focus in an effort to engage Damascus has emboldened the Assad regime. Bashar al-Assad openly mocked U.S. efforts to try to pry Syria away from its ally Iran only days after U.S. Undersecretary of State William Burns' visit to Damascus. This is all the more troubling since Syria's clandestine nuclear program, "together with [its] extensive surface-to-surface missile capabilities, is a major source of potential contention and conflict between Syria and Israel." A week after Burns was sent to Damascus, Bashar made clear how little he values U.S. concerns when he hosted Iranian president Mahmoud Ahmadinejad and Hezbollah leader Hasan Nasrallah for dinner in Damascus. Syria's recent revival of economic and political ties with Russia is also a cause for concern. After Russian president Dmitry Medvedev went to Damascus in May 2010 (the first meeting between the two countries' leaders in nearly a century), a series of deals was concluded on weapons sales alongside discussions on boosting economic ties and nuclear cooperation. Abu Dhabi's National wrote that, given slow U.S. rapprochement with Syria, "Damascus could be forgiven for thinking that, following the Russia summit, it is successfully outmaneuvering Washington and holding an increasingly stronger hand." Washington's new policy of engagement has also encouraged Syria to flex its muscles in neighboring Lebanon. As a consequence of U.S. attempts to diminish Syria's diplomatic isolation, the Lebanese leadership has had little choice but to work with Bashar, this despite the fact that Syria had occupied it for twenty-nine years and only recently was forced to leave following international pressure. These developments appear to have done nothing to hinder the Syrian regime from continuing to operate as usual. It is in the interests of the United States and the West to put pressure on the Syrian regime rather than to continue to extend a hand in the hope that the regime will unclench its fist. By catering to Syria's demands, the West appears to be abandoning the few advocates in Syria who want reform. The corrupt practices of the regime hurt Syrian citizens but also fuel Syria's terrorist activities and interference in the affairs of neighboring states with direct consequences for the United States and the West. Anna Borshchevskaya is a research analyst at the Peterson Institute for International Economics. The Syrian Monitor, Center for Liberty in the Middle East, Washington, D.C., Apr. 21, 2007. "2008 Corruption Perceptions Index," Transparency International, Berlin, accessed May 4, 2010. "2009 Corruption Perceptions Index," Transparency International, Berlin, accessed May 4, 2010. Doing Business 2010: Reforming through Difficult Times, The World Bank, Washington, D.C., Table 1.3, p. 4. "Background Note: Syria," U.S. Department of State, Bureau of Near Eastern Affairs, Washington, D.C., Feb. 17, 2010. Author interview with analyst for Western firm in Damascus, Damascus, Aug. 13, 2008. Eliyahu Kanovsky, "Syria's Troubled Economic Future," Middle East Quarterly, June 1997, 23-9.
 Business Intelligence Middle East (Dubai), Dec. 21, 2004; "Syrian Arab Republic: 2008 Article IV Consultation," Country Report No. 09/55, International Monetary Fund, Washington, D.C., Feb. 2009, p. 9. "Syrian Arab Republic: 2008 Article IV Consultation," Country Report No. 09/55. "World Economic Outlook Database," International Monetary Fund, Washington, D.C., Apr. 2010, accessed May 8, 2010. Nimrod Raphaeli, "Syria's Fragile Economy," The Middle East Review of International Affairs (MEMRI), June 2007, p. 37. "Syrian Arab Republic—2009 Article IV Consultation Preliminary Conclusions of the IMF Mission," International Monetary Fund, Washington, D.C., Dec. 21, 2009. Heba El Laithy and Khalid Abu-Ismail, "Poverty in Syria 1996-2004, Diagnosis and Pro-Poverty Considerations," United Nations Development Programme, New York, June 2005, p. 1. Al-Thawra (Damascus), Jan. 22, 2008, in "Syria: Population Growth Exceeded Food Production Rate," MEMRI Economic Blog, Jan. 22, 2008. Al-Thawra, Mar. 11, 2010, in "Syria: 5-Year Plan Failed to Meet Objectives," MEMRI Economic Blog, Mar. 3, 2010. The New York Times, Aug. 15, 2007. The Moscow Times, May 12, 2010. "Background Note: Syria," Feb. 17, 2010. Author telephone interview with Nimrod Raphaeli, Washington, D.C., Mar. 2, 2009. Author telephone interview with Volker Perthes, director of the German Institute for International and Security Affairs, Berlin, Mar. 5, 2009. Paul J. Sullivan, "Perspective: Waters, Wars, Wheat, Watts, Waste and Wasta Add Up to Syria's Liquid Worries," Circle of Blue-WaterNews (Traverse City, Mich.), Feb. 16, 2010. Al-Thawra (Damascus), Jan. 22, 2008, in "Syria: Population Growth Exceeded Food Production Rate." Author calculations: See "Regional Forecast Detail: The Middle East & North Africa," Prospects for the Global Economy 2010, The World Bank, Washington, D.C., accessed May 10, 2010. Andrew Tabler, "Global Economic Crisis Boosts Utility of U.S. Sanctinos on Syria," PolicyWatch, no. 1482, The Washington Institute for Near East Policy, Washington, D.C., Feb. 26, 2009. Author calculations: See World Economic Outlook Database, Apr. 2010. The National (Abu Dhabi), Mar. 3, 2010. "2010 UNHCR country operations profile: Syrian Arab Republic," The United Nations High Commissioner for Refugees, accessed May 14, 2010; The National, Mar. 3, 2010. The National, Mar. 3, 2010. Author interview with Bashar Elsbihi, Washington executive director, National Salvation Front in Syria, Washington, D.C., Apr. 16, 2009. Alan George, Syria, Neither Bread Nor Freedom (London: Zed Books, 2003), p. 33. See, for example, Farid N. Ghadry, "Syrian Reform: What Lies Beneath," Middle East Quarterly, Winter 2005, pp. 61-70. BBC News, June 11, 2000. Mona Yacoubian and Scott Lasensky, "Dealing with Damascus. Seeking a Greater Return on U.S.-Syria Relations," The Center for Preventive Action, Council on Foreign Relations, New York, CSR 33, June 2008, pp. 10-1. At-Tiyar as-Sooriy ad-Dimocratiy (Coventry, U.K.), July 12, 2006. Al-Tiyar al-Sooriy al-Dimocratiy, July 12, 2006. Ghadry, "Syrian Reform: What Lies Beneath," pp. 61-70. "Qaaima biAhm 100 rijal 'amaal, fi Sooriya, wa Rami Makhluf yaghiib, 'anha," Al-Iqtisadi (Damascus), Apr. 30, 2009. "2007 Corruption Perceptions Index," Transparency International, Berlin, accessed May 4, 2010. "2008 Corruption Perceptions Index," Transparency International. "2009 Corruption Perceptions Index," Transparency International. "2010 Index of Economic Freedom: Syria," The Heritage Foundation, Washington, D.C., accessed May 26, 2010. "2010 Index of Economic Freedom: Libya, Iran," The Heritage Foundation, Washington, D.C., accessed May 14, 2010. "2010 Index of Economic Freedom: Syria"; "2010 Index of Economic Freedom: Property Freedom," The Heritage Foundation, Washington, D.C., accessed May 10, 2010. "2010 Index of Economic Freedom, Ten Economic Freedoms of Syria," Heritage Foundation, Washington, D.C., accessed May 4, 2010. Obaida Hamad, "The Cancer Within," SyriaToday (Damascus), July 2008, p. 16. Author telephone interview with Volker Perthes, Mar. 5, 2009. Søren Schmidt, "The Developmental Role of the State in the Middle East: Lessons from Syria," presented at the Economic Research Forum 14th Annual Conference—Institutions and Economics Development, Cairo, Dec. 28-30, 2007. Volker Perthes, Syria under Bashar al-Asad: Modernisation and the Limits of Change, Adelphi Paper 336 (Oxford: Oxford University Press, 2004), p. 38. Author interview with Bashar Elsbihi, Apr. 16, 2009. Author e-mail correspondence with Bente Aika Scheller, country director, Heinrich Boell Stiftung, Afghanistan, Apr. 8-11, 2010; Economist Intelligence Unit, London, Oct. 14, 2003. "World Economic Outlook Database," Apr. 2010. "Syrian Arab Republic, Country Brief," The World Bank, Washington, D.C., Mar. 2010. The Washington Post, May 26, 2010. Author interview with anonymous source, Damascus, Aug. 24, 2008. Author interview with anonymous source, Damascus, Syria, Aug. 24, 2008. "Syria: Code of Good Practices on Transparency in Monetary Policy Article IV," EStandardsForum, Financial Standards Foundation, New York, Aug. 2008. "Country Report Syria: Economic Performance," Economist Intelligence Unit, London, May 2010. "IMF Executive Board Concludes 2009 Article IV Consultations with the Syrian Arab Republic," International Monetary Fund, Washington, D.C., Mar. 25, 2010. "Syria: Overall Standards Summary," EStandardsForum, Financial Standards Foundation, New York, Aug. 2008. Executive Order 13460, "Blocking Property of Additional Persons in Connection with the National Emergency with Respect to Syria," United States Department of Treasury, Washington, D.C., Feb. 15, 2008. Executive Order 13338, "Blocking Property of Certain Persons and Prohibiting the Export of Certain Goods to Syria," United States Department of Treasury, Washington, D.C., May 13, 2004. "Treasury Targets Rami Makhluf's Companies," United States Department of Treasury, Washington, D.C., July 10, 2008. "Rami Makhluf Designated for Benefiting from Syrian Corruption," United States Department of Treasury, Washington, D.C., Feb. 21, 2008. Executive Order 13460, Feb. 15, 2008. Author interviews with U.S. Department of Treasury officials: Stephanie Aken, international economist; Hagar Hajjar, Middle East policy analyst; Dan Moger, Middle East policy advisor, Washington, D.C., Mar. 6, 2009. The Washington Post, Feb. 22, 2008. Tabler, "Global Economic Crisis Boosts Utility of U.S. Sanctions on Syria." Andrew Tabler, "How to React to a Reactor," Foreign Affairs, Apr. 19, 2010. David Schenker and Matthew Levitt, "Dinner in Damascus: What Did Iran Ask of Hizballah?" PolicyWatch, no. 1637, Mar. 2, 2010. The National, May 17, 2010. Related Topics: Syria | Anna Borshchevskaya | Summer 2010 MEQ receive the latest by email: subscribe to the free mef mailing list This text may be reposted or forwarded so long as it is presented as an integral whole with complete and accurate information provided about its author, date, place of publication, and original URL.